Take a holistic, integrated approach to Regulatory Compliance. Data is at the heart of Digital Innovation and organizations globally are transforming their businesses to take advantage. Whilst this strategy is a key focus, emerging data protection regulations demand better Information Management and Governance processes to ensure the business implications of GDPR become part of day-to-day operations. Gaining visibility, insight and analysis of what data you have, where it resides and how the business uses this critical asset is pivotal to positioning good data governance and accountability to drive the wider benefits of becoming compliant. 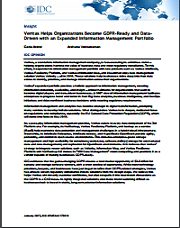 This IDC Insight paper highlights the importance of the changing privacy landscape, especially the GDPR and how Veritas is a facilitator of achieving regulatory compliance. To learn more, please complete and submit the form to access a complimentary copy of the report.